What is there to be said with regard to Marx that has not already been said? What Marx pop trivia remains hidden? As there are quite a few ‘idiot guide’ commentaries on Marx, the immediate answer might very well be: not much. Peter Singer’s Marx: A Very Short Introduction, Terry Eagleton’s Why Marx Was Right, and Jonathan Wolff’s Why Read Marx Today are but an Amazon order or Google Books search away. All these primers are in the myth-busting mode, exoterically casting off vulgar, doctrinal Marxism, and are far removed from the esoteric tangents of Western Marxist philosophising. Evidently, one can never say never when it comes to new things to say. To borrow from Donald Rumsfeld, we cannot know unknown unknowns. A hitherto unread document or some new insight into Marx’s utterances can never, like the proverbial black swan, be ruled out. One can not simply assume that novel exegesis is no longer possible. What is more, given this present conjuncture, to return to Marx now is to appropriate him in a way that is thought-provoking. The work of David Harvey is an obvious example. And, of course, there is always the ‘layman’ reader coming to Marx for the first time, complete with a thirst for knowledge. To what extent Paul Thomas’s primer, Karl Marx provides a new ‘perspective’ (173), is open for debate. This book’s message is familiar to anyone aware of the ‘idiot guide’ tradition. Thomas is a doyen of those who would split Marx from, not lump him with, Engels and the Marxists.He does not say anything that splitters have not flagged up before, or that writers who approach Marx through the secondary parasitic comments of others forget at their scholarly peril. ‘This book,’ writes Thomas, ‘concerns itself with how Karl Marx’s work relates to his works, how his life relates to his scholarly output or intellectual and political legacy’ (27). When Thomas refers to Sartre’s notion of a ‘Marx beyond Marxism’ (16), when he suggests that, as a rule of thumb, one should start with ‘treating Marx in context’ (16) and when he mentions the great Marxian cliché ‘moi, je ne suis pas marxist’ (41), it rather implies that Thomas belongs to a type of corrective Marxian Cambridge School of reading. He concludes his book’s mission statement with ‘[b]ut what may seem to us insignificant, ephemeral, bombastic or ad hominem seemed important at the time to Marx, and this book is among other things an attempt to explain or understand why this was so; an attempt, that is, to locate Marx in his own time and place’ (27). But to characterise Thomas so is far too sweeping for two reasons: firstly Thomas is aware that Marx is a plaything. ‘The task,’ writes Thomas, ‘of severing the Marxian from the Marxist is in no sense an easy or straightforward one and it would in any case be slavish to suggest that Marx should be given the last word on his own doctrine’ (15). Marx is not ‘simon-pure’ (21). ‘This book,’ Thomas makes crystal clear, ‘is undertaken not for the sake of uncovering or disinterring a pure, unsullied Marx, sufficient unto the day, whose words alone will cast confusion to the winds’ (15). 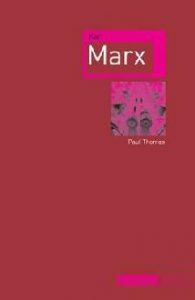 Reception is for Thomas an issue: one must get to know Marx through ‘an open minded, constructive encounter … salutary and advantageous’ (15-16). Marx the theorist, for Thomas, is an activist trying to speak to an audience in order to ‘channel discontent into worthwhile directions, guard against blind alleys and false friends, and reground struggle’ (167-8). Secondly, this book is not intended to bring to light new textual conclusions. It is a primer with a message: Marx was a political writer (22-7) and ought to be viewed accordingly. He fleshed out the useful vocabulary of proletariat, commodity fetishism and mode of production. The book follows Marx’s intellectual development chronologically. The reader is taken from Trier, to Bonn and Cologne, to Paris, then Brussels, and then finally London. The narrative that unfolds is uncontroversial. Marx’s Young Hegelian coquettishness and his materialist foray into liberal journalism in the Rheinische Zeitung concludes with his 1844 revolutionary proclamation of the coming proletariat in the ‘Introduction to a Critique of Hegel’s Philosophy of Right’ in the Deutsch-Französische Jahrbücher. Once in Paris ‘Marx, largely under the influence of Engels, immersed himself in economic analyses, the immediate upshot being the Economic and Philosophic Manuscripts’ (56). Here Marx began to get a solid grip on his theme. The proletariat is not some essential social category, but a capitalist category. No longer was it to be the case of pitying the wretched labouring multitude. Thanks to Marx’s by now non-inchoate analytical thinking, the subjective emergence and entrenchment of both a proletariat and the transformative class, tied to the capitalist mode of production’s reproduction, was crucial to politico-revolutionary understanding. ‘Capitalism’s lineaments,’ Thomas notes, ‘are susceptible to a historical and economic tracing out’ (75). Starting with the Manuscripts, and continuing into the Grundrisse and Capital, Marx became a scholar of capitalism, presenting a ‘double-barrelled’ (76) argument that highlighted the immersive properties and inherent fragility of the capitalist system, all for a specifically working class cause célèbre. The Brussels’ period of 1845 to 1848 and the beginnings of the Marx-Engels intellectual relationship in The Holy Family and The German Ideology followed on in this vein. They laid out the entanglement of capitalist relations: its ‘all engrossing system of specializing and sorting men’ (84). Politics and economics are definitively un-separated in this vision: the Klasse für sich of The Poverty of Philosophy. Culminating in ‘Marx’s Manifesto’ (99) — ‘an instance of theoretical audacity [that] changed the rules of the game once and for all’ (99) — politics would never be the same. In the Communist Manifesto, this defragmentation of capitalism is manifest. The proletariat are the victims and victors. The jail of the capitalist integument is an open prison. Virtuous ideas are ideological inhibitions. And then finally the post-revolutionary move to London by ‘the Marx ménage’ (120). At this point, Thomas disputes, in a quintessential anti-mythological pooh-poohing gesture, Marx’s parentage of Freddy Demuth (121-2). For Thomas, continuity is evident as Marx settled in his new homeland. The Eighteenth Brumaire of Louis Bonaparte continues on from Klasse für sich and from the need for class self-mastery, along with the recognition of its limitations. This voluntaristic element in The Brumaire was increasingly balanced by an acceptance than one did not simply make revolutions: ‘[s]truggle grows out of structure under the right enabling conditions, and Marx was careful to insinuate himself as a theorist on the cusp of the difference between the two’ (129). Next Thomas makes a point of introducing Capital, volume 1 before the 1859 ‘Preface’ to A Contribution to the Critique of Political Economy (142-3). Capital is the mature statement of Marx’s account, while the ‘Preface’ is Marx’s position paper, not the definitive study of his ‘social ontology’ (146). It is in Capital that Marx’s stress on capital’s ‘kinetic quality’ (147) provides rich insight for future theorising in actual practice. And it was in the International Working Men’s Association, that Marx was to find a movement that his contributions could aid and assist in response to the machinations of Mikhail Bakunin and the Anarchists. Once again, as in the revolutionary 1840s, as Marx’s son-in-law put it, he sought ‘to place [his] knowledge at the service of humanity’ (165). Marx’s career was one of industrious labour. Following this tour of Marx’s life, the reader is left with an activist intellectual called Marx. To Thomas, ‘Marx’s words are extraordinary … because of what Marx thought theorizing could do: it could after all be an Archimedean lever with which to move the world’ (166). Thomas casts his man as taking a third way that was neither overly ‘visionary’, nor ‘quotidian’ and practical (27). Marx was fighting for change via his unique epistemic framing of capitalism and politico-class struggle. He was a theoretical agent provocateur. Marx was never writing theory in the way, for example, the contextualists’ bête noire, the Lovejoyian historian of ideas (if such a figure even is conceivable) would, as an eternal doctrine. In Thomas’s eyes, it was Marx’s talent for putting the politics into theory, his ‘tocsin’ (98), and vice versa that was his immediate contextual intercession as well as his legacy rolled into one. Given its contextual pretensions, further contextualism on Thomas’s part would have been welcomed in terms of the network of ideas in which Marx’s interventions took place; that is, Marx’s theory and its intimate relations with other theories, those statements it confronted as instituted theoretical tocsins such as the political economy of Adam Smith and David Ricardo, and the anarchism of Pierre-Joseph Proudhon. Of course, these figures are mentioned, but the richness of the intellectual ether of Marx’s time and place is often elided in Karl Marx. Marx the Promethean activist is often at the expense of its exposition. Moreover, the work is missing an index. As mentioned, whether Karl Marx brings anything to the table of interpretations Marx is debatable. However, as a primer, it adds yet one more reminder to read Marx himself, to hold up Marx the political theorist and framer of our understanding of something called capitalism.